This collection of essays challenges static and binary discourses regarding the Cuban healthcare system, bringing together papers that paint a nuanced and dynamic picture of the intricacies of Cuban health(care) as it is represented and experienced both on the island and around the world. Health Travels is the first collection of its kind to map the recent history of the Cuban healthcare system in rich ethnographic detail. 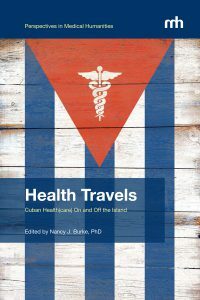 This collection of essays challenges static and binary discourses regarding the healthcare system, bringing together contributions that paint a picture of the nuanced and dynamic intricacies of Cuban health(care) as it is represented and experienced both on the island and around the world. In each instance, papers address macro-forces – national policies and global strategies – as well as micro-practices that at times counter, and at other times support, state-level programs. Exploring the praxis at the juncture of daily bodily practices and global representations this collection highlights how the Cuban state is instantiated in different contexts and for various purposes. Illuminating the complexity of the divide between the state and el pueblo, contributors to this volume highlight contradictions in daily living and the “success” of the Cuban health care system.